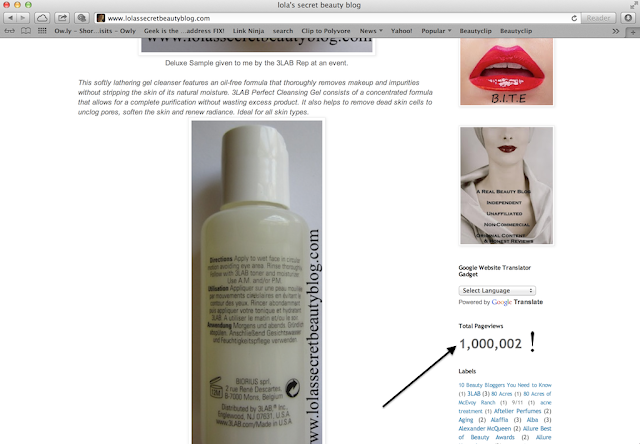 lola's secret beauty blog: Milestone of a Million+ for Lola's Secret Beauty Blog! Milestone of a Million+ for Lola's Secret Beauty Blog! A million thanks to you, my beloved loyal readers! This milestone would have been impossible were it not for your much appreciated visits to my little corner of the blogosphere! xoxox, Helen (& Lola, of course). Congratulations! And thank *you* for the wonderful posts. Amazing news! May your lovely blog continue to grow. Congratulations! That's awesome! We keep reading because of the great posts you keep putting up! Can't wait to see what appears in the next million page views! Congratulations! That's awesome! Looking forward to what great posts will keep us coming back for more in the next million page views!